We live now in the in-between weeks, the days when seasons and weather contest for space and place. Today is nominally sunny; nominally warm, too. In reality, the sun spends at least as much time behind a pale gray veil as it does out in the open, and the “warm” air is rent by the wind’s bitter edge. Tomorrow will be cooler still, followed by rain and even snow on Wednesday (if, that is, the forecast can be believed). And there will warmer days thereafter, followed again by more cold and heavy weather, until summer finally comes into view. For now, we are past the thaw and moving through the melt, our world making its way into the run-off. It will seem heavy this year, as though the waters are high and running hard for lower ground. In truth, everyone has simply forgotten what “normal” looks like. Not quite everyone, of course. Our peoples tend to have long historical memories, having learned from childhood the patterns of time’s arc for our worlds, whole cosmologies handed down from one generation to the next for stewardship and safekeeping, and that is as true here as anywhere. And both cosmology and memory come into play this time of year, as ditches are redug and riverbanks renewed, the debris and detritus of another winter cleared and removed, the better to permit reclamation and rebirth. In the run-off season, the rebirth comes down with the water. 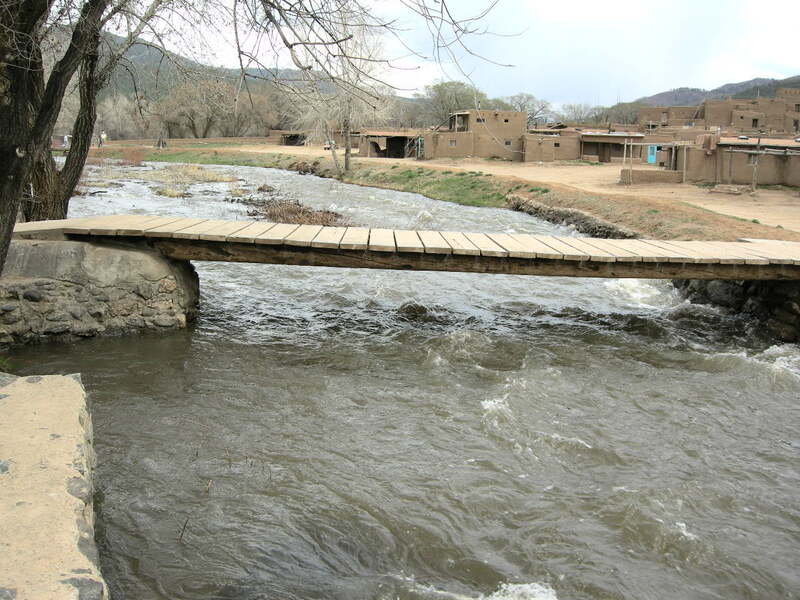 On this day, the Rio Pueblo no doubt looks much as it did in the image above: a roiling pewter cascade capped here and there with white, racing downriver beneath pale blue skies fading into gray. It’s still cold, and it looks it; no inviting warmth here yet, only the certainty of cold. It’s an ancient line of demarcation, one well-suited to this day in the contemporary world, marking as it does the middle of this month (and colder, more commercial and colonial points on the calendar, too). But water, here, is both boundary and center, line of demarcation and whole world in itself. I have long called it the first medicine, and so it is, but is also that from which we ourselves are born in the most literal of ways — and that from which this starkly beautiful landscape was itself birthed. Eons later, in a world now old by our standards, the water no longer holds us in its embrace; it has grown scarce, and its embrasure is now our task: conservation, yes; preservation, certainly; stewardship, first, foremost, and always. For the moment, no water has come down to us; it is not time yet. When the run-off flow has reached sufficient volume, there will come a time when it can be turned to our own fields briefly, enough to ready the land for crops and gardens. This is not the time for planting, but for planning, for ensuring that we can make the most of what earth and sky grant to us this year, and to do it in a way that honors the obligations of stewardship. If we are fortunate, the forecast for a heavy monsoon season will hold, and so will our shorter-term prospects over the days to come. We live in a place and time of water in between — between land and climate, weather and season — and this is our time to find the medicine and facilitate the rebirth in those spaces. Posted on Monday, April 15th, 2019 at 1:27 pm. Filed under: The NDN Silver Blog Tags: Photography, The NDN Silver Blog	RSS 2.0 feed.